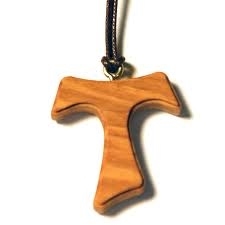 The TAU Cross is a symbol that is beloved and significant to all Franciscans. Saint Francis adopted the Tau Cross as his standard. He had such love of this symbol that he used it as his signature in later years. The Franciscan Sisters of Peace wear the Tau Cross as their official community symbol. Associate members also wear a version of the Franciscan Tau. Francis was present for part of the Fourth Lateran Council, and perhaps his devotion to the Tau came from that call of Pope Innocent. But more personally, it came from his involvement with the lepers in areas around his home in Assisi. The Antonians were a community of men that existed in Francis’ time, whose chief ministry was the care of lepers. On their habit they wore the Tau Cross, representing their fidelity to the passion of Christ and their devotion to serve the least of his brethren. Francis worked with the Antonians in caring for lepers and this was probably his first introduction to the Tau. In Francis’ mind and heart devotion to the Tau was devotion to the cross and to the person of Jesus. It was a symbol of conversion and redemption; and so it remains today for both vowed and secular Franciscans throughout the world.